Position an adjustable bench to a 45 degree angle (ensure bench has bars or pads to grip). Sit down with the back positioned towards the high end of the bench, the feet should be on the ground for stability. Reach back and grasp the bar(s) or pad(s) above the head. Lift your feet off the ground, keeping your legs straight at the knee. Bring your legs to a 90 degree angle with the torso, exhaling throughout this upward motion. While inhaling, lower your legs back down beyond parallel with ground but not so far down that your feet touch the floor. When complete with the desired amount of reps, place your feet on the ground, and then remove your hands from the bar(s) or pad(s). Not all adjustable benches can be used to perform this exercise. While the exercise is called "Incline Leg Raises" it is actually performed at an angle used primarily for decline bench press. In a pinch, a fixed decline bench press unit may be used to perform this exercise. Be sure to remove the barbell from the stand beforehand. 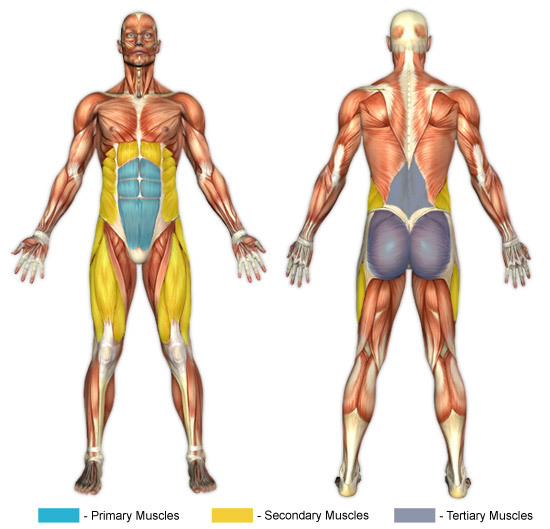 To target more of the middle and upper abdominals, the lower back and hips may be lifted off the bench on the upward motion, positioning the legs perpendicular to the ground. This contraction should then be held for a moment as those muscles are targeted. The greater the incline, the greater the difficulty of this exercise. Therefore, beginning lifters should set the incline low until they get the hang of the movement and gain strength. First - iliopsoas, tensor fascia lata, and rectus femoris. Performing incline leg raises improperly may lead to injury. There is a fair amount of stress placed on the lower back while performing this exercise and a conscious effort should be made to keep the lower back pressed against the pad. If you see or feel your rib cage pressing higher during the exercise, that means your back is probably arching, exposing you to potential injury. Another point of concern is the amount of strain placed on the neck during this exercise. Usually this is from the ergonomics of the bench itself as most benches were not designed with this exercise as their primary purpose.